The irrepressible Jessica McLeod and Edward J Grug III (who have contributed a ton of great stories to Top Shelf 2.0) sent over the most amazing care package last week. Check this out! One of the buttons (with the Bad Yeti on it) is missing because my girlfriend already nabbed it for herself! But otherwise, they say, this is everything they have in print! 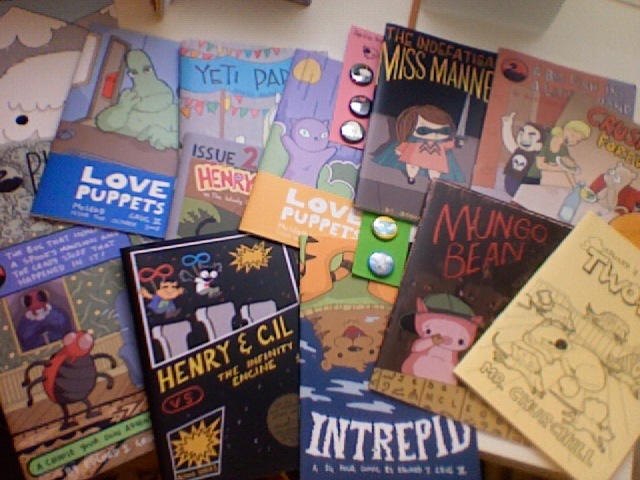 So go yell at them via Livejournal (Jess and Grug) and or possibly this online store URL make them sell you these amazing comics! Thanks, guys! You’re the best! 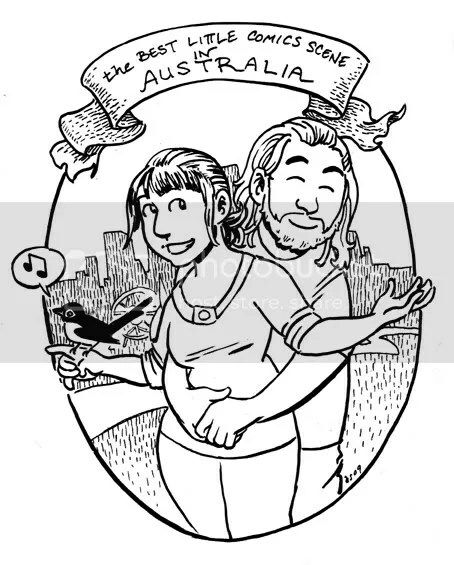 And an easy lock for Most Adorable Soon-to-be-Married Comics Couple in Australia! Nate Powell’s SWALLOW ME WHOLE nominated for LA Times Book Prize! Well, this is one of the most exciting press releases I’ve had the opportunity to write. Top Shelf Productions is bursting with pride to announce that Nate Powell’s graphic novel Swallow Me Whole has been nominated for the Los Angeles Times Book Prize! Although Swallow Me Whole was not created exclusively for young adult readers, it is fundamentally a story about the dark, quiet corners of adolescence. 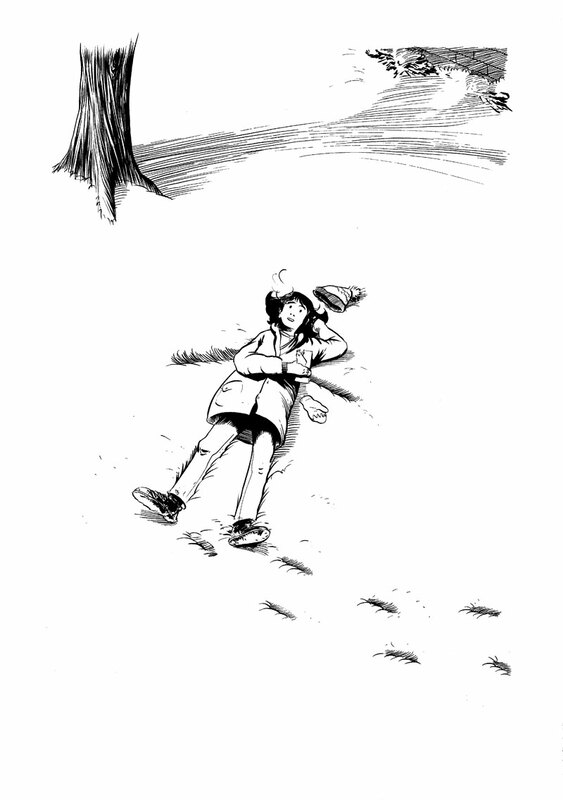 The book follows two teenage stepsiblings, Ruth and Perry, through the ups and downs of school, family, and suburban restlessness — all complicated by the insect armies, swirling visions, and haunting voices that no one else can perceive. Full press release, with more juicy quotes and a special mail-order deal, over at the Top Shelf site. I actually never realized it until just now, but Swallow Me Whole reminds me of a book from my youth, Neal Shusterman’s 1992 YA novel The Eyes of Kid Midas, which I discovered around age 10. Midas started out incredibly familiar — not just presenting a realistic world that resembled my own life, but incorporating fantastical ideas and events that felt exactly right. Yes, that’s what I would do if I found a pair of sunglasses that made my wishes come true. Since I spent so much of my youth thinking about the fantastical, it was actually a more accurate portrayal of my world than a straight-up realistic novel would have been. Swallow Me Whole is more challenging than Kid Midas… but it’s also more real. I love thinking about what it might do for young people. It might screw them up, in the good way. It might even help them put themselves together. Well, the initial announcement of our Ax news seems to have everybody excited (which is really gratifying — thanks, guys). I’m still playing catch-up myself! This is an earlier announcement than we normally do, so the questions are pouring in before even we know exactly what’s going to be in the book. Archer Prewitt’s Sof’ Boy? Adrian Tomine?! Jason?!? How deep does this rabbit hole go? Today’s Top Shelf 2.0 story is new material from Kagan McLeod — a sort of “bonus chapter” never before seen in the original self-published Infinite Kung Fu comic book. Kagan has been going through and “remastering” the whole series, often re-inking whole pages, in preparation for the release of the complete IKF graphic novel from Top Shelf next year. Today’s is an example of an all-new scene that he’s added to improve the flow of the story and lay the groundwork for the whole plot. In the coming weeks and months, we’ll continue to serialize the book with regular web updates, just as we did with Matt Kindt’s Eisner-nominated Super Spy. Q. How did you come up with the idea for Garfield Minus Garfield? A. I wasn’t the first person to come up with the premise for Garfield Minus Garfield but I think it’s fair to say I did champion and popularise it. The idea had been floating around on message boards for a couple years before I started posting them. As far I know, I was the first person to create a site devoted to it. I’ve said this to every interviewer who has asked me but it’s rarely published. And it’s pretty much impossible to find who did it first, believe me, I’ve tried. “I didn’t invent this” doesn’t make for good copy, it’s true. For a publicist trying to sell a new Garfield book to suburban housewives, it makes sense to play down that angle. But exploring the issue does lead to a fascinating debate about the future of content creation and the growing pains as traditional business practices clash with new ways of interacting with art. Some of which I tried to address in the original post. In any case, I did unfairly tar Walsh with the same brush that I attacked the endlessly-irritating Cheezburger guys with, which I gladly retract. Given the nature of metal’s core demographic appeal (young, working class, outsider, etc), it’s frustratingly rare to find articulate writers who genuinely “get” the genre. I identify closely with Darnielle; I think we both discovered that appeal despite being outside that demographic, which leads to a delicate balancing act between wanting to serve as ambassadors to the outside world, encouraging the sophistication of a relatively infantile artform, and trying not to patronize the existing fanbase. As somebody who has repeatedly found myself fascinated with various forms of “low” culture, I think about this kind of thing a lot. There’s always that dance when you discover something cool and edgy and feel like it deserves more exposure. There’s a temptation to serve as curator or even translator, sanding off the rough edges or repackaging it in a way that helps new people understand it — without taking credit for something that isn’t yours or destroying what made it great in the first place. Like any task, it can be done well or poorly. It’s something that every publisher does, but it seems especially central to Top Shelf’s mission: treading that boundary between artsy and populist. For instance, though I had no role whatsoever in its creation, I’m pleased to say that Cave Adventure is the most “mainstream” thing I’ve ever seen Michael Deforge do, and for that reason my favorite. I’m happy that he’s able to use his insane imagination to tell a coherent and hilarious story, and I think it actually fits in really well with Top Shelf’s aesthetic. I’m looking forward to more involved editorial relationships in the future (when I find the time — ha); when it’s done right, everybody wins.